1. Cut tomatoes in half and remove seeds and juice. Discard insides of the tomato. Chop into small pieces and place in a medium-size bowl. 2. I use about equal amounts of onion and tomato, so it will depend on the size of your onion. Chop desired amount into small pieces and add to tomatoes. 3. Slice jalapeno(s) in half and remove majority of seeds and veins (this is where the spice comes from). Chop into very small pieces and add to bowl. Tip: I usually wear gloves for this because the spice will stay on your hands for hours! Be cautious about touching your face after chopping. 4. Remove cilantro leaves from stalk and chop with knife or kitchen shears. I use about 2 T, but you can use more or less, if desired. 6. Add olive oil and vinegar and mix everything thoroughly. 7. 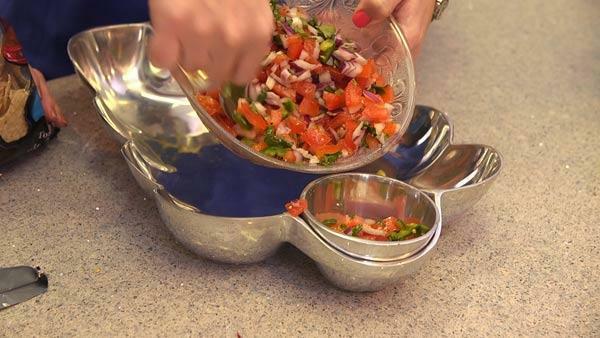 Serve with tortilla chips or as a topping to your favorite TexMex entr�e. This is great to make ahead and store in refrigerator to help all the flavors combine. Optional: Use habanero or serrano peppers for different spice or flavor. When using habanero, I like to cut the spice by adding fresh, chopped mangos or pineapple.